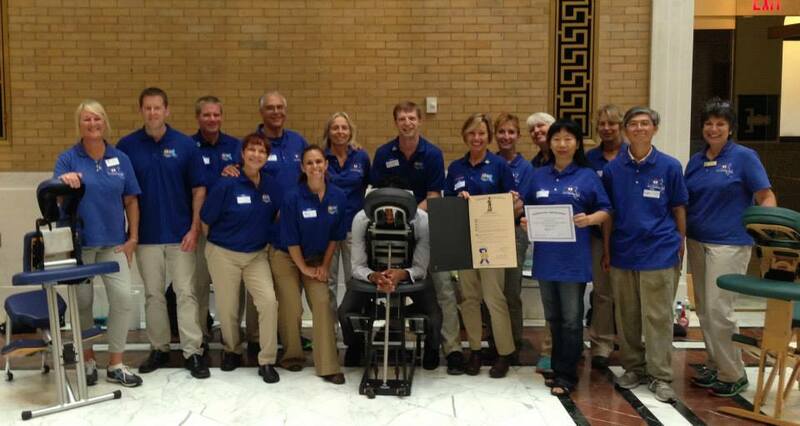 On October 16, 2014, thirty volunteers from the AMTA Massachusetts Chapter spent the day offering complimentary chair massage to over 130 individuals at the State Capitol, in honor of Legislative Awareness Day. This event (sponsored by Senator Dan Wolf) provides an opportunity for members of the AMTA to meet their legislators and directly advocate for the AMTA’s technical corrections bill (House Bill 185). Equally important is that it serves to educate legislators about the health benefits of massage therapy and the massage therapy profession, which is one of the fastest growing health care professions in the Commonwealth. This year, in the Great Hall of Flags, the volunteer team worked on individuals from over 50 offices, including the House sponsors of the bill (Chairman Antonio Cabral, Representative Brian Mannal and Representative Denise Provost) as well as many leadership offices. The AMTA team met folks from Senate President Therese Murray's office, the Speaker of the House, Robert DeLeo's office, the Speaker Pro Tempore Patricia Haddad, the House Ways and Means Committee as well as Chairman Brian Dempsey's office, and the House Chairmen of the Joint Committees on Public Health, Health Care Financing, Consumer Protection and Professional Licensure. A special thanks to all the volunteers for making the “Massage Therapy - Day on the Hill” the most popular event of the year!